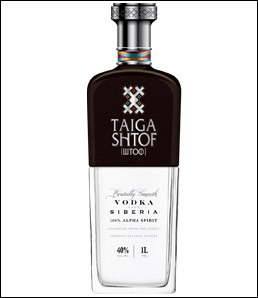 Taiga Shtof has introduced at Vinexpo Bordeaux its new premium vodka using wheat, rye and water from the Taiga region of Siberia. The vodka originates from the Taiga region in Siberia. It is column filtered through activated charcoal and platinum, and finally ice-treated for purity. The concept was to create a ‘Grand Cru’ premium vodka and Alpha Spirit. The brand claims to support the protection and preservation of the Taiga region, its nature and people. The name Taiga Shtof refers to the region the vodka originates from – the Siberian Taiga – and the traditional bottle that Russians used to drink their vodka from – the shtof bottle. Taiga Shtof has worked on its bottle design to symbolise this heritage. The new bo ttle structure features robust thick rectangular glass, which the brand claims emphasises clarity and quality, and is ergonomically designed with a genuine leather sheath and tribal ribbon accent which invokes the worship ribbons traditionally used by the tribes of Siberia. The vodka will become available via an international network of distributors in main markets and via Taiga Shtof’s international sales team.